Teaching high school level science can be very difficult, unless you are a high school science teacher. I am no where near that. I can easily handle lower level science, but the upper high school levels is above me. We recently had the opportunity to review the Physics 101 program from The 101 Series. What a cool way of "teaching" high school science!! Joey has been struggling using his high school level science books. I know that he is not totally understanding the different topics that he is reading. I was spending time scouring for extra Youtube videos to explain what he was trying to learning. That is a lot of extra time spent trying to learn high school science again. So I was very interested in a science program that was presented on DVD. The 101 Series provides a full line of science DVDs, including Physics 101, Chemistry 101, and Biology 101. We had received the Physics 101 DVD. 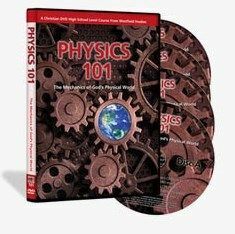 Written specifically for ages 15 and up, The 101 Series, Physics 101 program could be used by your middle school student also depending on their learning level. So you could easily use the Physics 101 program with multiple levels in your family. Taught from a Biblical point of view, Physics 101 gives your student a full view of the world that God has created for us. It covers information including electricity, Newton's laws of physics, the Electromagnetic spectrum, light, sound and even thermodynamics. Wes Olson presents the materials in a lecture type setting, right in your living room. This 4 DVD presents 20 different segments that last roughly 30 minutes each. The recommendation is that you cover 1 segment over a two week period. During that time, you will watch the segment, work on lab work and also will have a research report to work on. 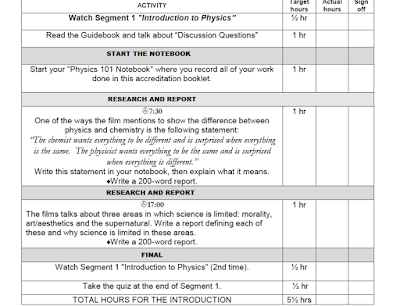 This will give your student a full overview of each learning segment. All the required lab items for Physics 101 are everyday items, most of which you have at home already or can buy easily at your local super store or hardware. Nothing fancy required. During each Lesson segment, it's not just lecture style. Plenty of picture examples are given during the lessons to keep your child's attention. That was one of my worries, keeping attention. When it comes to ADD, lecture style learning can become a waste of time. But the break-up of his almost storytelling style helped to keep all of our attention. Included also in your Physics 101 purchase are an Accreditation Book and a Guidebook for your program. Both of these are included on your final disk as PDFs that you open on your computer. Included in the Accreditation booklet is the information that your need for lab supplies, as well as a checkoff list for your student for each segment. They can easily use this program independently turning in their work to you as they finish it. I found this check off list also helpful for myself. Included in this list is the research information for each segment. It gives your student the information that they need to research and what questions they should be answering. The Guidebook PDF includes textbook type information for each segment. Almost like helpful notes from the lecture. Discussion questions and a short quiz is also included for each segment or unit. As I mentioned above, there is a planned 10 month study with Physics 101. But you could easily adapt this to your own needs. Instead of two weeks, maybe your student wants to do a segment a week. 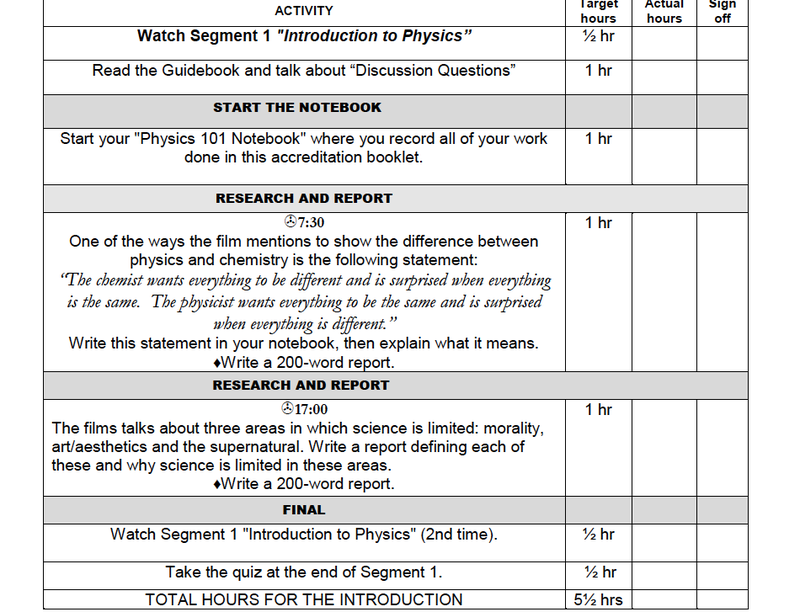 The approximate schedule suggested is 3.5 hours each week on science. But you might have a science lover, and they might choose to go through the program at a much quicker pace. That is a great thing about The 101 Series program, you can easily adapt it to your student. The biggest issue I had with the program, it does not have subtitles. This was not a big deal for Joey, but Brayden is obsessed with having subtitles on when he is watching TV. It really does help him to understand better to see the visual movement on the screen, but also read the subtitles. This is the only suggestion that I could make, please add subtitles to the program to help out those with special needs. Since Joey is delayed, we are making slower progress in the program than I planned. But with the suggested extra research reports and also the questions included in the Guidebook PDF, he is making progress with Physics 101. This is a big deal, because I really didn't think that we would be able to tackle high school level science. The cost of Physics 101 is $69.95, which is far less than other high school level science programs that we have been trying. I really wish I would have discovered The 101 Series before we started purchasing another program. I could have saved a ton of money. I have really fallen in love with this series, and plan on purchasing the others to help the kids continue to progress. Several members of the Homeschool Review Crew were given the opportunity to try out The 101 Series. Take some time to check out how they used this program in their homes and see what they thought of it. Just visit the link below.